We see bees often here in Southern Arizona – especially when spring is in full bloom. But with bees come the chance of swarms and stings. We primarily have Africanized bees… but, for the most part, they leave humans alone unless someone disturbs a hive or is in the wrong place at the wrong time. A few years ago Bill and I were out in the front yard doing chores and heard — then saw — a swarm of bees coming down the middle of our street. The swarm then flew across our neighbor’s yard (across the street from us) so we figured it went into the wildlife corridor behind their home. The next day we discovered the bees were hanging out in our neighbor’s mesquite tree so they called a bee removal team. Before the team arrived Bill took this great pic of the bee mosh pit. And yes … the below bee ball is solid bees! Then the swarm flew away just before the removal team showed up. Since spring has sprung in many parts of the world, we wanted to share some basic first aid tips about insect bites & stings in general. 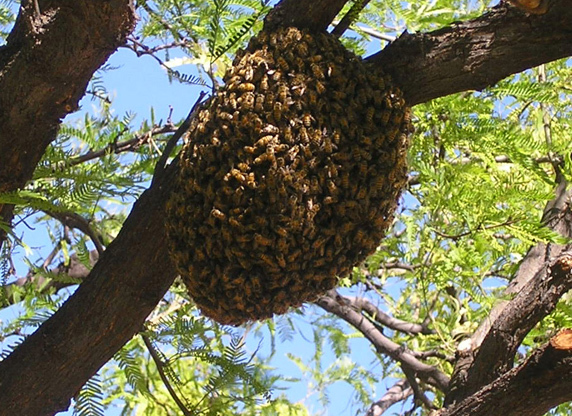 Move quickly and calmly away from area if there is a swarm, hive or nest nearby. If a bee sting, remove stinger(s) by scraping it away with credit card, knife or long fingernail. Don’t try to squeeze it out with your fingers or tweezers since this causes more venom to get in the victim. Wash the wound with soap and water or rinse with hydrogen peroxide. Cover with a bandage or clean cloth and apply ice pack or cold compress. Watch for allergic reactions for a few days (see above). Baking Soda – Make a paste of 3 parts baking soda + 1 part warm water and apply to the sting site for 15-20 minutes. Clay mudpack – If in the wilderness, put a mudpack over injury and cover with bandage or cloth. The mudpack must be a mix of clay-containing soil since clay is the key element, but don’t use if any skin is cracked or broken. Urine (Pee) – Another remedy useful in the wilderness sounds gross (but has a history of medical applications in a number of cultures) is urine (pee) which reduces the stinging pain. Unless you have a urinary tract infection, the pee will be sterile and at the least won’t do any harm. Stay indoors at dawn, dusk, and early evenings when mosquitoes are most active. Spray clothing and exposed skin with repellent containing DEET (N,N-diethyl-meta-toluamide) – the higher % of DEET, the longer you’re protected from bites (6.65% lasts almost 2 hours; 20% lasts about 4 hours, etc.) 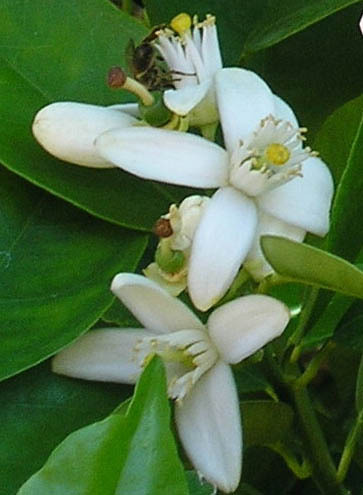 Two other repellents are picaridin or oil of lemon eucalyptus. Get rid of “standing water” sources around yard and home since they are breeding grounds for skeeters. The CDC says Vitamin B and “ultrasonic” devices are NOT effective in preventing mosquito bites! Several agencies need custom books for their communities ASAP so we plan to do a large bundled print late-May 2014. If you or any agencies, businesses or nonprofits you know would like a customized version of our disaster preparedness and first aid manual, please call Fedhealth at 1-888-999-4325 to discuss your needs. Books make great educational giveaways for employees, customers and local communities, and our customizable tool can help clear out leftover grant dollars that are time sensitive. We discount our 266-page book 50% to 70% off list (or as low as $4.50 U.S. each) and personalize them for free (in print process [1,000 units & up] .. OR .. with peel & sticker labels on our standard red books [any Quantity]). Also … going forward, we’ll be printing all custom pages in FULL color on glossy paper at no extra charge! And if you need additional pages, we can insert 48 to 288 color pages in front or back for an upgrade price. This feature comes in handy if agencies or groups want to partner with local businesses, chambers and others to include coupons and discounts for communities … or incorporate other booklets or educational materials inside custom books. We also have some creative revenue sharing ideas to help first responders, volunteers, nonprofits and others. Again, we hope to send all completed artwork to our printer late May for a late June 2014 delivery. Learn more or call us at 1-888-999-4325. You are currently browsing the Fedhealth blog blog archives for May, 2014.